Optimist International and President Jim Kondrasuk are encouraging Optimist Clubs to become Honor Clubs. In addition to declaring the 2016-2017 administrative year to be "The Year of the Honor Club," they are adding an extra incentive in the fourth quarter of the year. 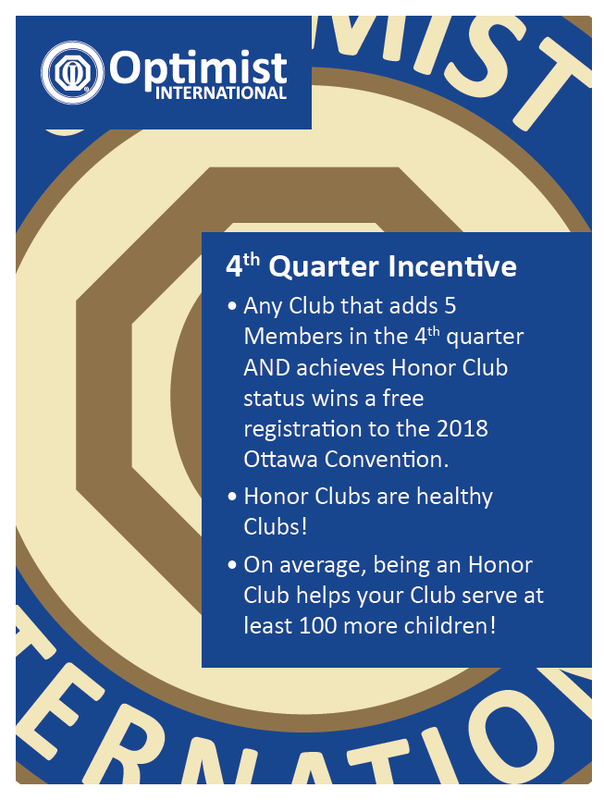 The incentive will reward every Optimist Club a free registration to the 100th Optimist International Convention in Ottawa, Ontario, Canada. To earn this reward, an Optimist Club must be an Honor Club or better and add 5 new members between July 1, 2017 and September 30, 2017. Doing so will make your club stronger! It's rather obvious that more members will allow your club extra hands to do more projects in your community. Being an Honor Club proves that your club is practicing excellent administrative practices as well. Can your Optimist Club be an Honor Club. Of course it can! And we can't wait to see your representative in Ottawa. The North Okanagan Optimist Club in Vernon, British Columbia has developed a year-round approach to its popular Unplug and Play program. In addition to its annual city-wide awareness campaign held in late April each year, it has also developed Unplug and Play boxes. The boxes, filled with balls, hula hoops, and other children's toys, have been placed around town. They ask for help from neighborhood volunteers to padlock the boxes at night and keep the club aware if new supplies are needed. What an awesome way to raise awareness for the Optimist Club and its mission: Bringing out the best in youth, community and you. When Optimist Club members attend district meetings and conventions, they learn more about the communities they visit. During the 2017 PNW District Convention, attendees got to learn just a little bit more about Boise, the Boise Noon Optimist Club, the Boise Noon Optimist Football Program and its relationship with the Boise State Broncos. Specifically, it is a very personal relationship for Head Coach of the Broncos, Bryan Harsin. 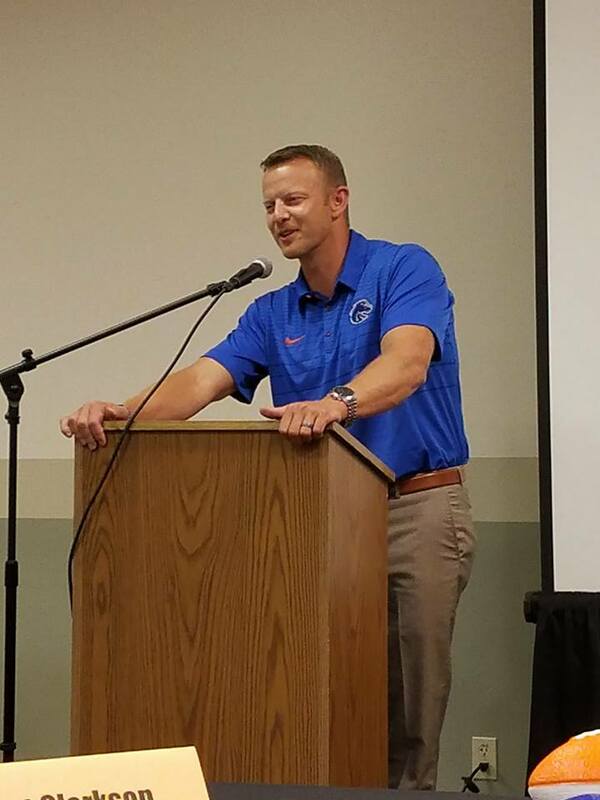 During a luncheon program, Coach Harsin shared that he started his football career at nine-years of age with the Boise Noon Optimist Club Football Program. What drew him to football? Harsin said that as a child, he liked football because he got to hit people. While that may seem overly aggressive, it is a positive way to channel young people's energy, build sportsmanship, teamwork, and strategy. As a coach, he teaches his players personal development along with their athletic ability. Optimist Clubs have a positive impact in their communities and on the young people they serve. The Optimist Youth Sports Complex in Boise and Coach Harsin are two examples of many from just one Optimist Club. Imagine what an Optimist Club might achieve in your community and get involved! Get your friends, family, neighbors and coworkers together start an Optimist Club today. The PNW District - Optimist International Convention was held August 10-12, 2017 in Boise, Idaho. 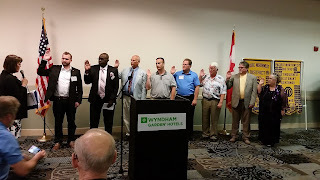 Approximately sixty-five Optimist Club leaders from British Columbia, Idaho, Oregon and Washington gathered for training of incoming officers and shared fellowship at a number of social activities organized by the Meridian and Boise Noon Optimist Clubs. 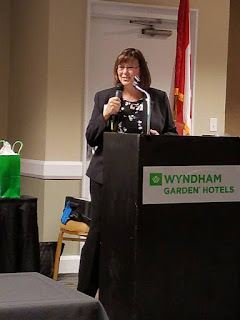 Susan Fix, Optimist International Representative and Vice President of the Great Plains Region, led club officer-elect training and help prepare incoming club presidents and secretary/treasurers for their upcoming roles. She emphasized Honor Club as a way to success. Susan also presented a session on how to have fun meetings. Of course business needs to be conducted, but that doesn't mean club members can't have fun in the process. Her tips focused on being kind, remembering those who weren't there, celebrating those who are, and influencing positive attitudes and expectations. Lieutenant Governors are expected to make one visit to each club in their zone during the year. Voting strength for clubs has been changed to one vote per each ten members or majority fraction thereof and one delegate registered, certified eligible, and present for the convention may cast all votes on behalf of the club. 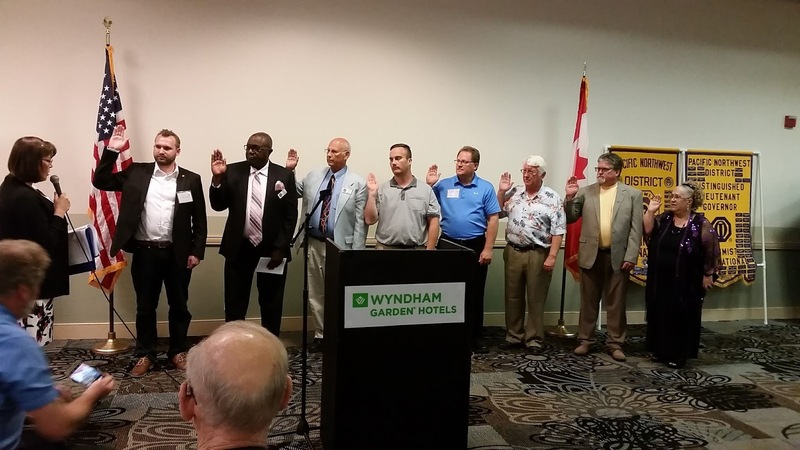 The Board of Directors, which consists of the executive committee and all Optimist Club presidents in the District, may be installed at the annual convention or at the first opportunity following the beginning of the administrative year. In additional business, Governor-elect Bruce Gilbertson requested that the PNW District CCDHH Contest be placed in a one-year hiatus. This was amended to "if participants outside of British Columbia are not secured by December 2017." In response to concerns raised regarding the poor accessibility of online resources, a resolution was passed to create a committee to review and recommend changes to the District's websites by October 1, 2017. We heard there were four or five new club building ideas on the drawing board, including one in Spokane that Jim Boyd, Director of Strategic Growth, Optimist International, will be attending for the second time; however, those in attendance were not invited to participate. The Board of Directors meeting ended following the election of the Governor-elect. Candidates Teresa Wallace and Ben DeRemer, both of the Gresham Optimist Club, made speeches outlining their vision and experience. In the first time that vote totals were ever disclosed, Ben was elected in a close race, 39 to 31. Sponsor pins for recruiting new members were awarded. Committee chairs who had lived up to their personal goals submitted to the Governor at the beginning of the year were given a gift from the Governor. Rose Brodie was named the Roy Proctor Lifetime Achievement recipient. Susan Fix gave a motivational and interactive address with tips to encourage attendees to live a happy and kind life. Awarding of silent auction items. Approximately $755 was raised with the disbursements as follows: Optimist International Foundation - $105; Childhood Cancer Campaign - $45; Children's Optimist Foundation of Canada - $30; and the Pacific Northwest District treasury - $565. With the dinner coming to a close, the officers for 2017-2018 were installed by Susan Fix. Speaking very briefly, Governor-designate Bruce said that he did not want to be a Distinguished Governor. He wants to be the Governor of a Distinguished District. He invited everyone to come to the next meeting in Kennewick, Washington October 27-28, 2017 and learn more. Ben DeRemer of the Gresham, Oregon Optimist Club has been chosen as Governor-elect of the PNW District - Optimist International. He will become Governor of the PNW District on October 1, 2018. 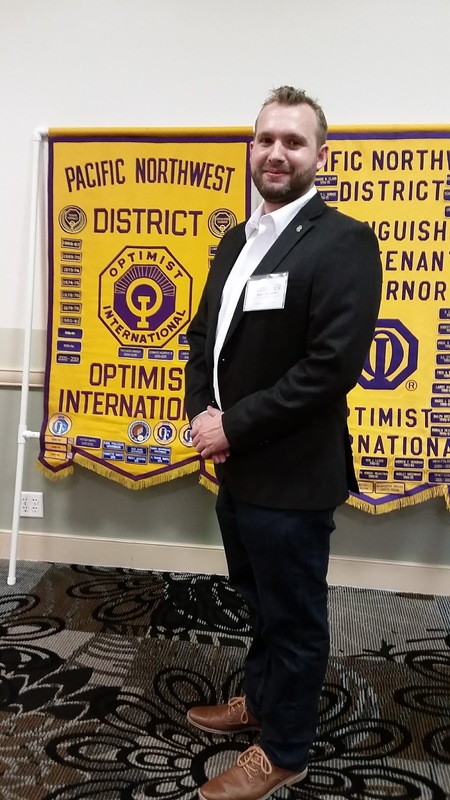 Ben has previously served as the President of the Gresham Scouters and Gresham Optimist Clubs and both clubs earned Honor and Distinguished awards during his term. He has been a Lieutenant Governor of Oregon Zone #3 and a District Committee Chair overseeing Activities and Awards. A member since 2012, he has already earned the Builder of Excellence Award from Optimist International for starting a new Optimist Club. In July 2017, Ben was invited to attend the Optimist International Leadership Academy. While there, attendees were encouraged to step-up into leadership roles in their respective districts with the goal of becoming a governor sooner than later. Ben has done just that and we congratulate him on his enthusiasm and accomplishments. Each year, at their annual conventions, Districts in the Optimist International organization choose the person who will lead them one year from now. This person spends their first year as a governor-elect where they observe, analyze, help and plan. On their promotion to Governor, they bring their strategic plan forward to help the District they serve, and thereby Optimist International, grow in membership and service to youth, communities and ourselves. Your children are ready to return to school (well, maybe not so much) and Optimist International is ready too. To help prepare the youth for a major in optimism, we encourage every Optimist Club to invite one teacher - or more - to join. 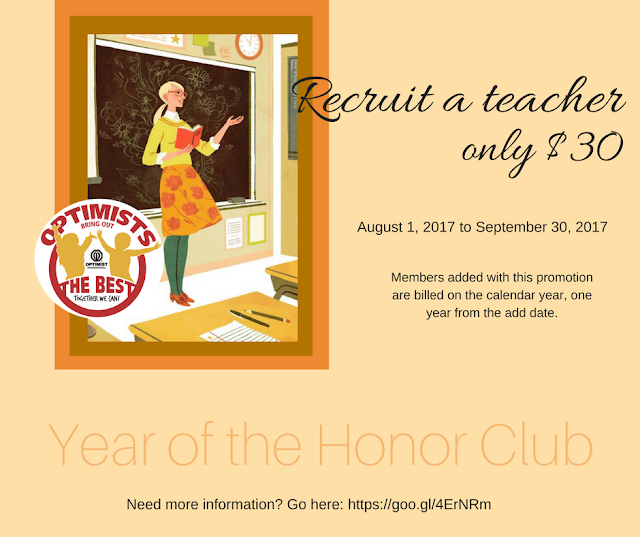 From August 1 through September 30, 2017, teachers and all school personnel may join an Optimist Club for only $30. Find out more at this link: https://goo.gl/4ErNRm.